Coach training programmes usually focus strongly on teaching the skills of non-directive coaching. This is a sensible approach, since people new to coaching and the helping professions typically see helping others as consisting of telling them what to do differently (or suggesting or advising, etc). Breaking this habit is difficult and so a relentless focus on helping the novice coach shift their attention away from telling the coachee what to do, to helping the coach learn how to surface and explore the coachee’s resources and resourcefulness is vital. The moment of breakthrough to non-directive coaching is a delight to observe and is signalled by the coach’s realisation that it is the coachee, not the coach, who has to do the hard work of discovering how to change! Indeed, one of the most reliable signs that a coach has “lost it” in a session is the feeling of trying hard! Mike the mentor had a post on the subject some time back, here is the article, read it and make up your own mind. 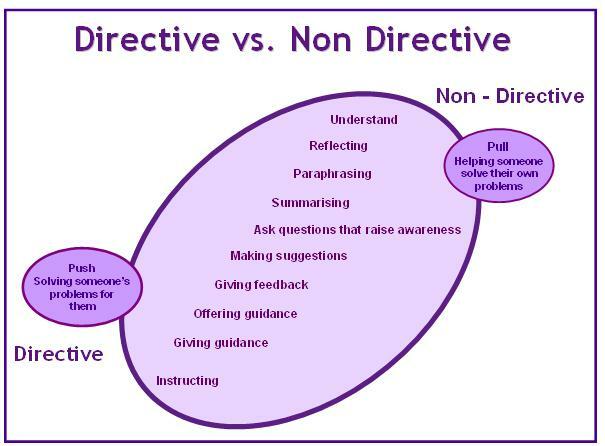 One Response to Being a good coach is it the same as being a non-directive coach?